Wooden board construction with shiny printed laminated design. Large mirror on inside lid. 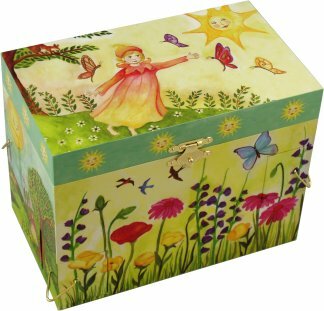 A bright & cheerful musical treasure box with a little elf playing with the butterflies in amongst the flowers in the garden. This larger music box has four secret little drawers; one on each corner to hide trinkets & treasures. 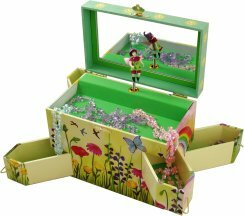 Open the music box to hear the music play and watch the elf twirl to the music in the mirror.